OSWEGO, NY – The Port City will light up for the holidays on Thursday evening. 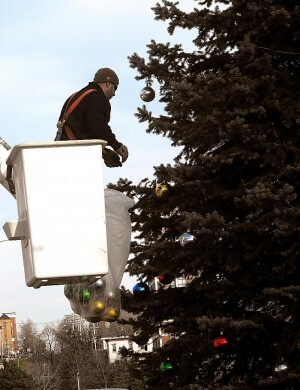 A DPW worker hangs ornaments on the city’s living Christmas tree on Monday in preparation for Thursday’s ceremony. After the city tree is lit, Santa Claus will be available in City Hall (outside the Council Chambers) to hear the Christmas wishes of children. School children have been asked to write holiday poems for the event. Also, those attending are asked to bring a non-perishable food item to be donated to charity. The Oswego Lions Club will serve light refreshments to those waiting in line to see Santa Claus. Holiday music will be provided by the Oswego High School Ensemble, the Snowbelters barbershop singers and Larry Rapshaw. Steve Westcott will provide the sound system. Youngsters don’t have to leave right after meeting Santa Claus. There will be fun and games and crafts for them in the Council Chambers.